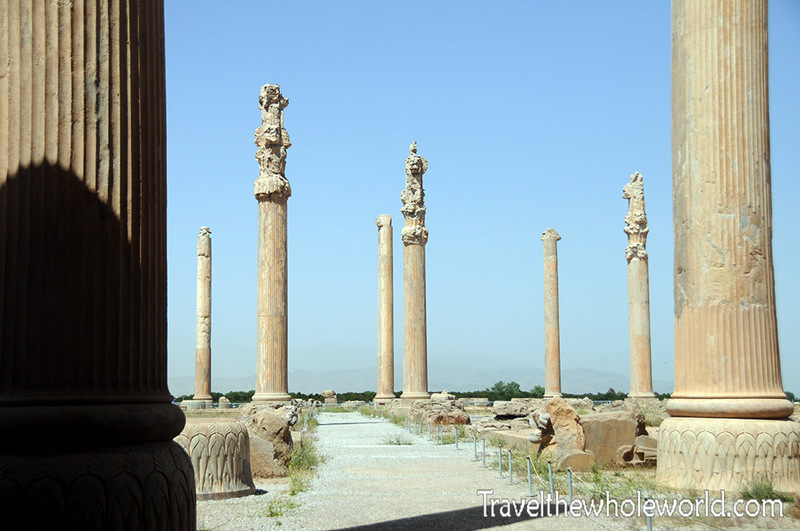 Iran is known as being the heart of the former Persian empire, also called the Achaemenid empire. 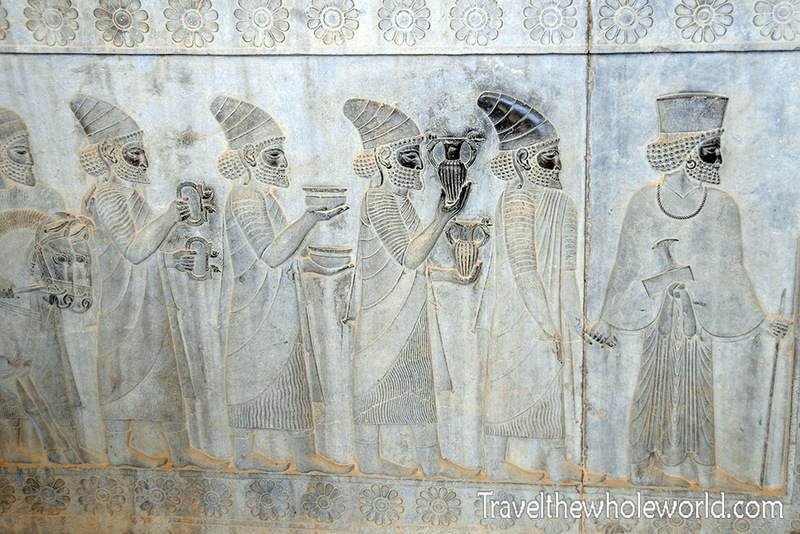 This incredible civilization was founded by Cyrus the Great, who is also known as Cyrus the Elder. At the time of its existence, Persia was the largest empire the world had ever seen, spanning from parts of Africa to India, and as far north as the Caucasus mountains. The Persian empire essentially united all the world’s first great civilizations in the region. This included civilizations in ancient Egypt, the Euphrates and Mesopotamia, and those established along the Hindus River. Cyrus the Great is of course admired for his military strategy and leadership, but beyond that he stands out from most ancient rulers because of his respect for human rights. As a leader, he vowed to never force anyone to change their religion and stated that the people of his empire were free to live a culture or practice any faith they wanted. This was documented on the famous Cyrus Cylinder, which inscribed laws protecting ordinary citizens and is believed by some to be the first human right laws in history. 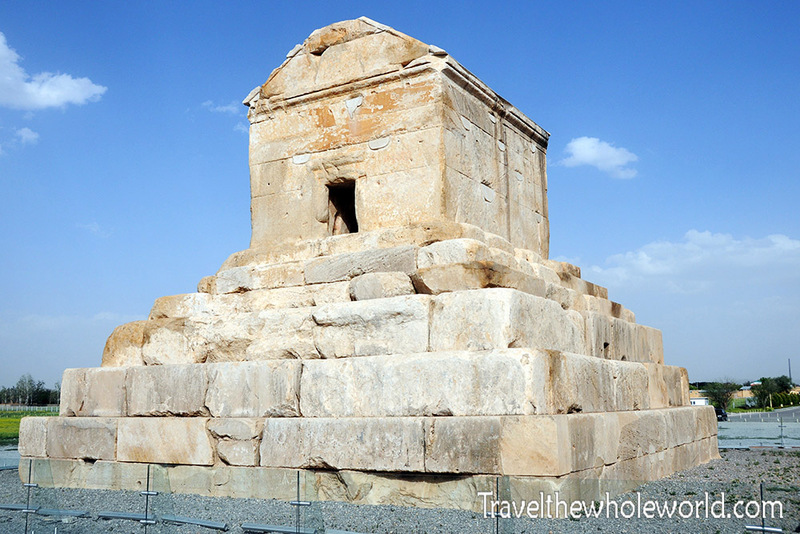 The photo above shows the tomb of Cyrus the Great located in the small town of Pasargadae. 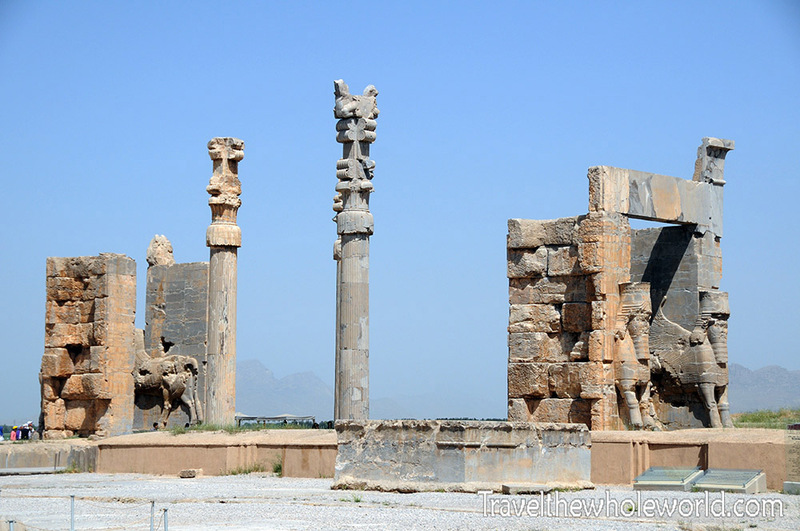 Persepolis was the cultural capital of the Persian Empire, with a history that began over 2,500 years ago. The photo above shows the remaining stone carvings of a giant horse, that was placed at the entrance to the city. In the photo below, you can see the remains of the city gate from afar. I assume that once upon a time large fortifications lined the gates on both sides, but have since eroded away. 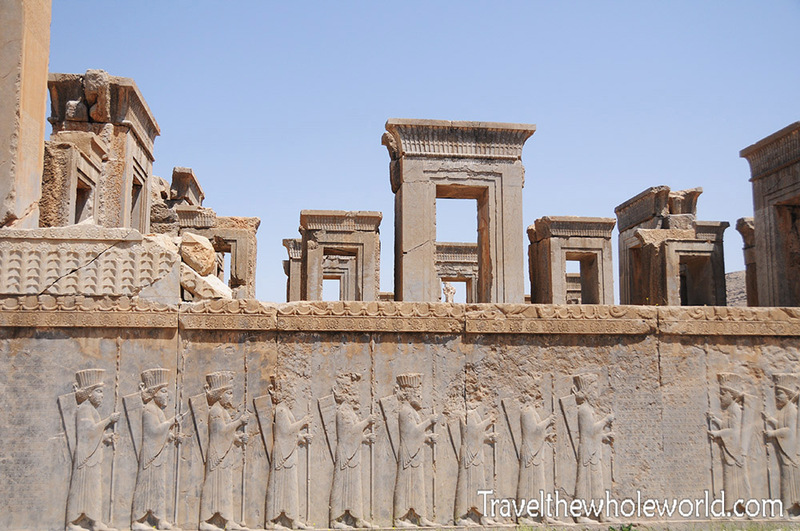 Persepolis was the cultural capital of the Persian Empire with a history that began over 2,500 years ago. 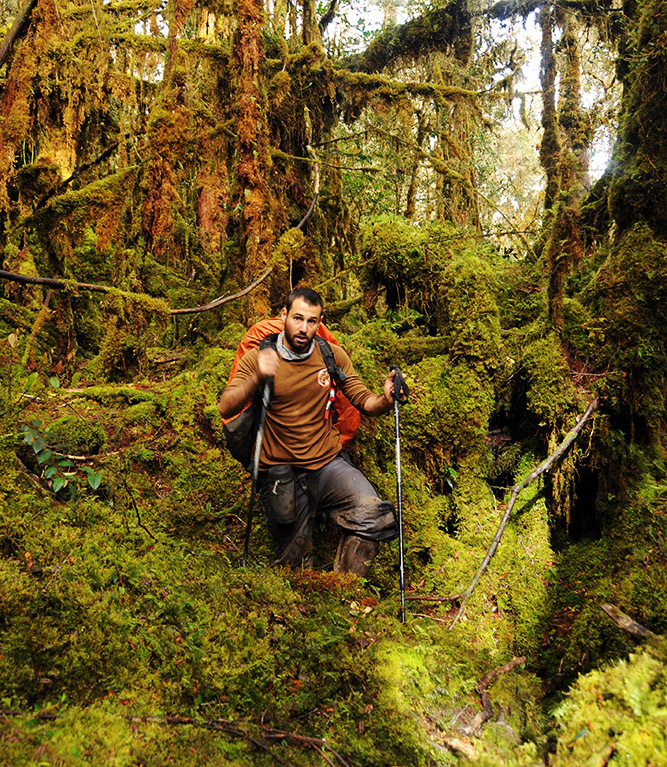 It’s incredible to imagine such a complex society spanning a large part of the globe so long ago. From this perspective, the photo above shows an angle of the city that makes it look largely intact despite the passing millenniums. Mostly it seems some of the giant columns, arches, and a few fortified walls are the only things that survived however. This photo below shows what’s immediately past the entrance. Thousands of years ago people would have entered through the city gate and then traveled along this path. 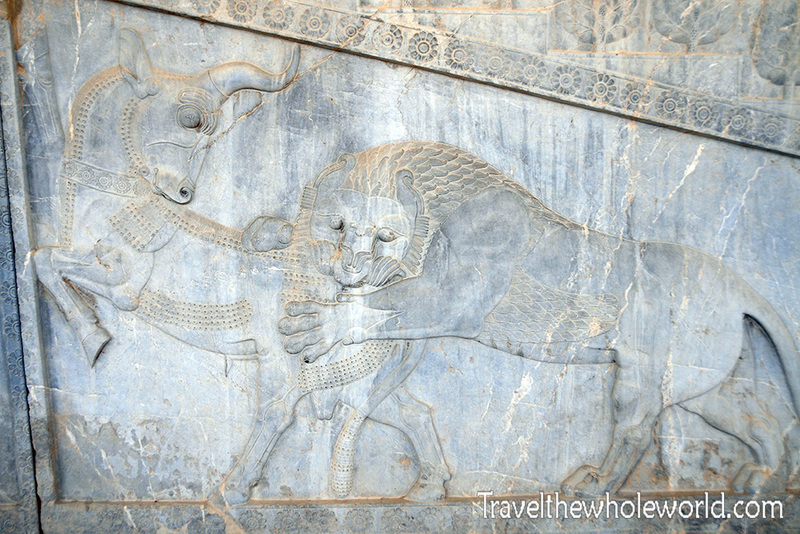 What I liked most about Persepolis was their ancient reliefs that depicted their city and their people. These two reliefs above and below were in amazing condition. Many of the reliefs depicted the different cultures and ethnic groups such as Egyptians, Indians, and Ethiopians who were all part of the Empire. Cyrus the Great made a point that all citizens felt welcomed. 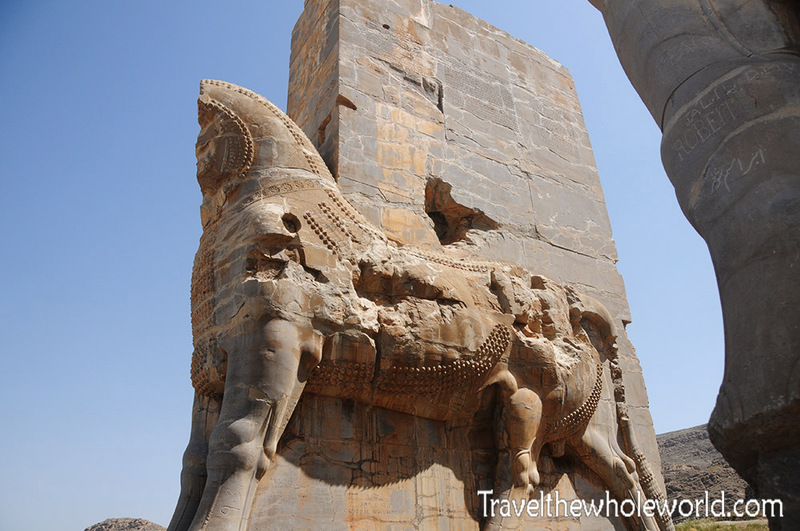 As another example, the entrance to Persepolis was called the Gate of All Nations. I liked these reliefs so much that here is another two. For me it was one thing to read about something in recorded history, but it’s another to see how ancient people imagined themselves and their lifestyle. The photo above clearly shows Persian soldiers, and below is another example of ordinary citizens and some of the animals they have domesticated. Lastly, I thought I’d include one of the most common reliefs I saw throughout the city. It seemed a bit random for them to create this lion attacking an ox in so many places. I’m not sure if this is true, but was told this represents the changing of zodiac signs rather than a lion devouring an animal. That didn’t exactly make sense to me, because the lion and ox are not next to each other in the Zodiac calendar! 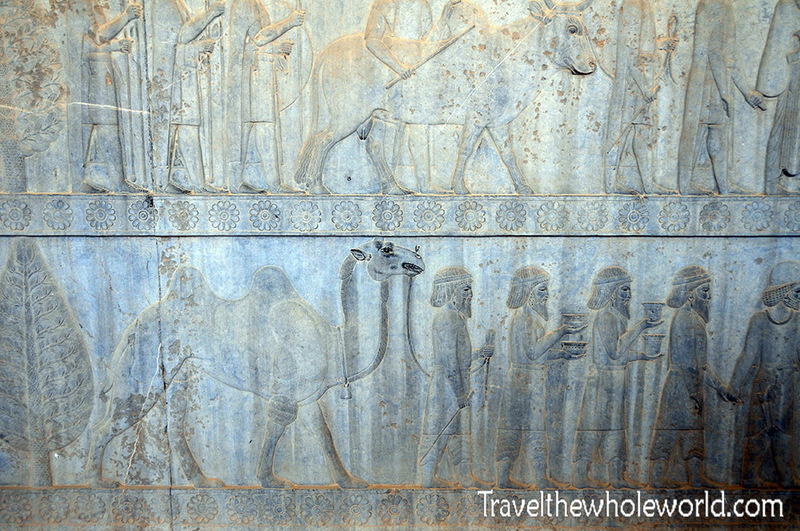 Just a few minutes driving northwest of Persepolis is Naqsh-e Rustam; a burial site for future Persian Kings who ruled after Cyrus the Great. Of all the Persian Kings, I think Xerxes is the most known. He further expanded the kingdom, but was defeated by the Spartans. Movies like 300 show him in a not so flattering way. Of course that wasn’t historically accurate, but nevertheless that was was the same Persian King who is now buried in this tomb above. I was a bit disappointed to find some ugly scaffolding by his grave when I visited! 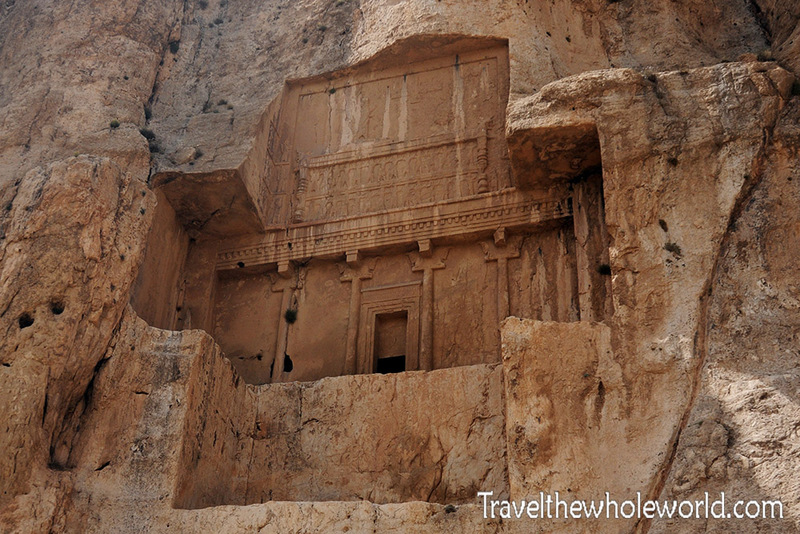 Of the tombs in Naqsh-e Rustam, only this one above by Darius was marked by the Ancient Persians. The remaining tombs were identified by archaeologists and seem relatively confident with their conclusions. Also buried here are Darius II and Artaxerxes. A local Iranian who was with me in Naqsh-e Rustam often referred to Alexander the Great as “Alexander the not so Great”. He defeated Darius III after several battles that took place over a decade. 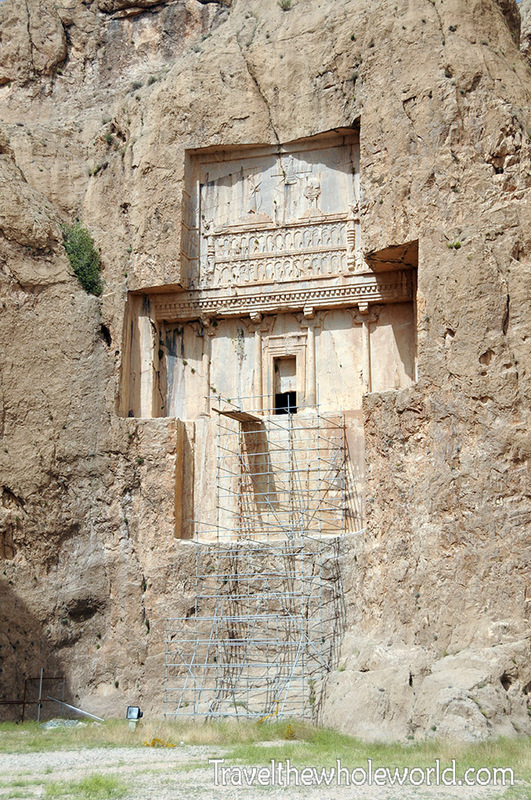 After conquering Persia, he looting these tombs which removed some important artifacts and history from Naqsh-e Rustam. 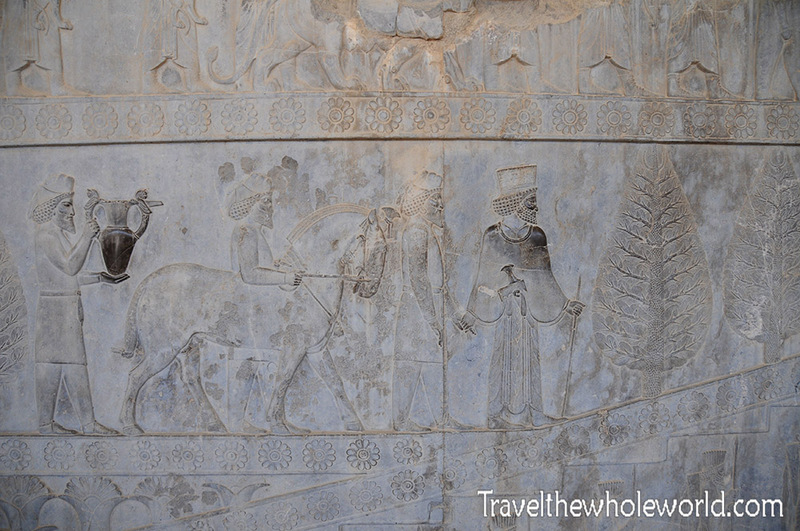 Like Persepolis, Naqsh-e Rustam has several reliefs, but many tell specific stories. 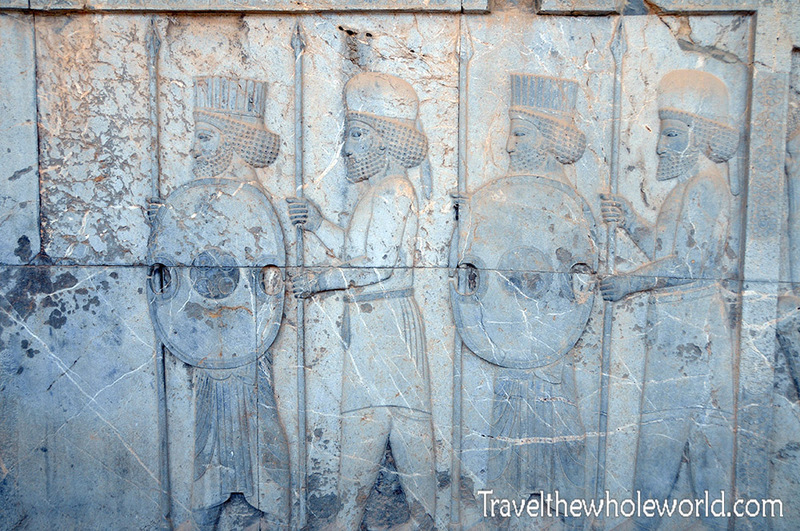 The most famous relief here is known as “The Investiture of Ardashir”. Ardashir is being given the “Ring of Kingship” by the Zoroastrian god Ahura Mazda. This was created in the 3rd or 4th century, and is the first time in history the word Iran has ever been used to describe these lands! 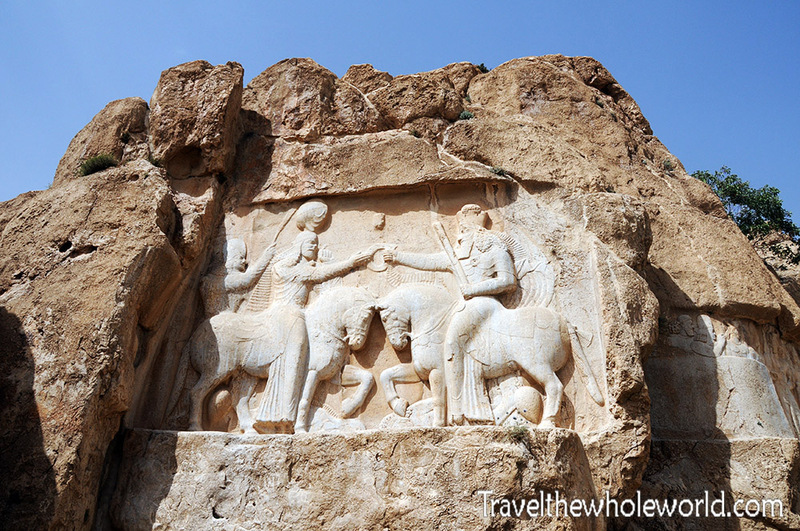 While there is a lot that is known about the Persian empire and Naqsh-e Rustam, there is still a lot that isn’t known. From my other photos on this page, it’s obvious that this building is very different from the rest. 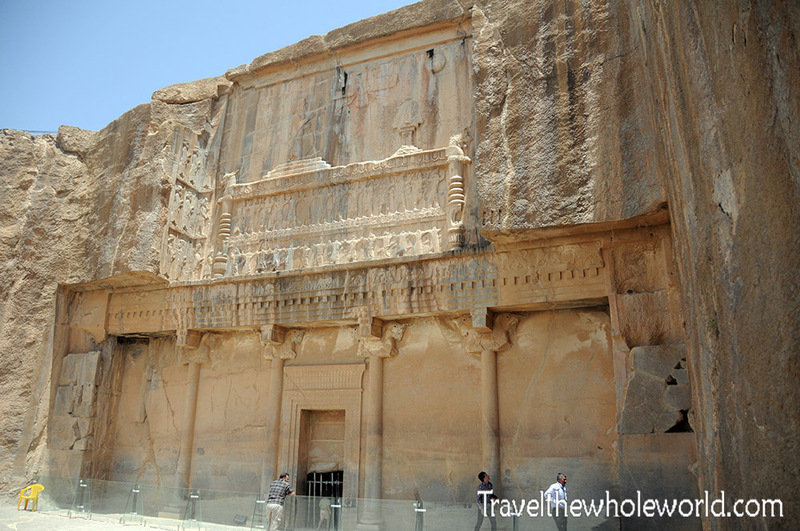 Known as Ka’ba-ye Zartosht, this building has writings from two ancient Persian languages as well as Greek. There is a lot of details of the structure that archaeologists have figured out over the years, but the exact purpose of this building is controversial. While I’m in no place to take sides, the idea that it’s a fire temple makes the most sense to me. 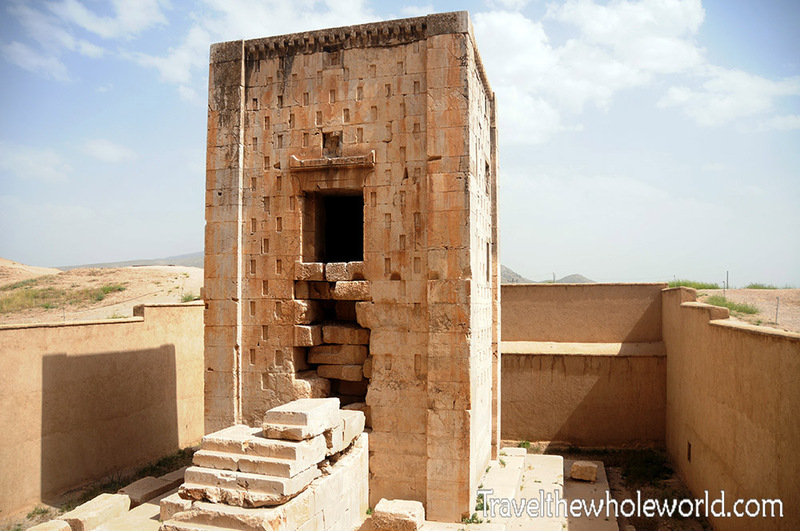 Fire temples existed in the region, and from me it looks like it had a similar design to those I saw in other parts of Iran or Azerbaijan.